Imperfect Action will guide you to greater levels of achievement and success. The other day I was teaching at our Aikido Dojo (Japanese Martial Art School). I was observing a relatively new student attempting to perform a new technique that she was learning. She was doing fine until suddenly she moved in the wrong direction, colliding with her attacker. The result is that both of the students fell to the ground from the collision. My student was able to smile because her training in the art of falling (ukemi) was now protecting her when she fell. Secondly, she knows that the next time she will move in the correct way so as to avoid the collision with her attacker. The Dojo is one of the few places I know of where “failure” is encouraged. I want students to fail when training in the Dojo. This way of training gives the student critical feedback. Feedback helps them hone their skill and technique faster than if they did it perfectly the first time. I pray that my students never have to execute a technique outside of the dojo. In the event that they need to defend themselves on the street, their training will allow them to execute correctly when they need it the most and not be frozen in fear, because they have done the technique hundreds of times before. The only person in life who truly fails at anything is the perfectionist who takes no action toward anything meaningful. We use fancy words like “procrastination” or “postpone” to intellectually rationalize our inability to act on the things we want. Do you want to cure your failure or fear of failure once and for all? The cure is to become an imperfect action taker. Nothing is ever perfect. The imperfect action taker who shows up is the one who claims the rewards. 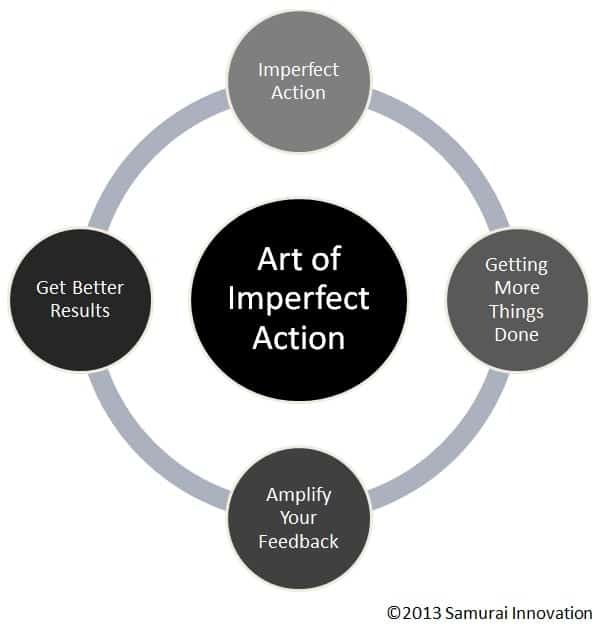 The imperfect action taker by default is on a path to mastery. Getting something done at 70 to 80 percent of perfection is better than the procrastinator who waits for perfection to act. You get over the fear of failure by striving to be imperfect. You begin living and working with the mindset that you will not ever get it 100% right or perfect. You start adopting an attitude of “done is good” because you know there will always be a tomorrow to improve upon what’s been done. You strive for 70%-80% excellence in finishing your tasks. Believe me, something finished or produced with a 70 out of a 100 level of excellence will be worth more to you than taking twice as long to get something done at a 100% level. My Aikido students would never achieve their Black Belts if they waited to perform their techniques at a 100% level. Yet after many years of training at a 70%-80% level, they reach a level of proficiency that we reward with a Black Belt. By the way, Black Belt means you are a “master of the basics”. For years, I have known that one area my business clients seem to struggle with is the area of goal achievement. The people I train, coach and mentor are sharp people. About two thirds of my clients are business owners running successful businesses but they struggle to get their highest goals done. The reason they struggle is that they spend too much time on being a goal-setter versus being a goal-getter. I would rather shift my focus onto getting my goals done than wasting time on creating elaborate, fancy, multifaceted plans that keep me stuck in a perfectionist mindset. I admit that I’ve had the solution for my clients all along. I have used it myself over the years to achieve many worthy goals such as losing 30 pounds, earning my third-degree Black Belt and doubling my income to name a few. But what I was failing to do was to share the process with my clients so that they too could get their goals done faster. I made the decision to document the process and create an easy to use guide for my clients so that they could become goal-getters. The result was the creation of Your Best 90-Day Plan. This simple guide has begun transforming my clients’ goal achieving abilities. The best part is that I got the plan done, published and sold in under a month. My clients are now benefiting from the value that the plan is bringing into their lives and businesses. 1. Write your idea or goal down. I am a huge advocate of using that old school way of writing by hand with pen and paper. It does so much more for your mind, body and spirit than tapping on a keyboard or tablet screen. Identify the next step that you can take today, tomorrow and this week. Find out who else is doing or has done what you want to do. This will give clues as to how viable your idea or goal is. All you need to do is make your idea unique and different from the crowd. 3. Test your idea in miniature first. Take a class on your area of subject matter. Write an article and publish it versus writing a whole book. Talk to 2-3 people who have gone before you in your area of interest. Ask them about the highs and lows of their journey. Decide if it’s for you. The key here is to get feedback quickly. 4. Cut your learning curve in half or more. Find that person who has gone before you. Be humble and admit that you likely aren’t the first person to attempt your idea or goal. Look for the people who have succeeded and get their recipe and adapt it to your needs. That’s what I did to create Your Best 90-Day Plan. I used a recipe that helped me produce my plan quickly and avoid further delay. 5. Show up one imperfect action at a time. The easiest way to succeed is by showing up and getting things done imperfectly. Seek out feedback from the process once you’re done. Then you can take that feedback and make improvements over and over. There you have it, a few easy steps to help you become even more successful through the Art of Imperfect Action. When you allow yourself to be imperfect, you will get more things done. Getting more things done will amplify your feedback. With more feedback you will get better results. We can all strive for reaching better results in all aspects of our lives. What Imperfect Actions will you take today, tomorrow and this week? Leave a comment below so that we can continue sharing our thoughts.